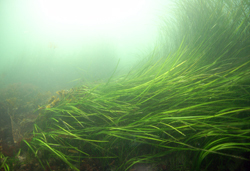 In the marine environment, seagrasses are exposed to an array of hydrodynamic processes including waves, tides, and currents. Although an intermediate amount of flow such as that of estuaries and other embayments may provide the most optimal conditions for growth and expansion, they are capable of surviving in relatively high energy environments (high exposure to wave energy, currents, etc.) as well. 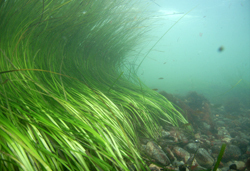 Seagrasses in wave swept environments tend to exist in patches and have longer blades which help minimize drag to prevent dislodgement. As current velocity increases, the ratio of above to below ground seagrass biomass decreases (Fonseca et al 1983). High currents and waves lead to course sediments, loss of organics, and diffusive loss of porewater nutrients into the water column.